The ceremony is for the couple the most profound and life changing part of their wedding day, where every second spent will be memories that last forever and ever. Sharing your vows and absorbing to carefully chosen words and prayers by your celebrant, means this place and moment in time is truly sacred. To align with the rest of your modern and stylish wedding, a statement ceremony arch is a must-have. The arch is the first major decor feature your guests will see, so why not make it even more incredible and jaw-dropping? Ps. Nothing says you can’t incorporate several styles all at once! Which one is your favorite? If you are a romantic at heart or simply a lover of bright colors, a floral arch is a given! These statement structures are certainly impressive! The modern couple will love to say I do next to a geometric shape – aren’t these just so geo-rgeous? A floral hoops instead of a traditional bouquet became the it-accessory for brides and bridesmaid last year – and a circular arch definitely is as spot-on trend! This Scandinavian inspired ceremony style is a uber-chic choice that will never go out of style. 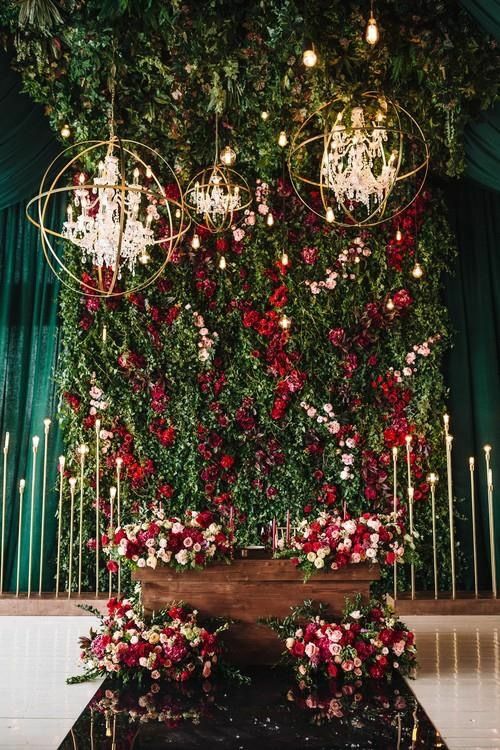 The rugged warehouse aesthetic works so well with soft florals and gorgeous lighting – combined with the green minimalism or dried florals and you’ll have ceremony look that will be the talk of town! A fabulous new trend for 2019, using dried flowers in your floral installations has become an continuation of the popular pampas grass features. It really creates a dreamy and ethereal look which lends itself naturally to a wedding ceremony.